FindMe is a free app from Electric Pocket which enables users, their friends, family and colleagues to share their current locations automatically and securely on Facebook through their BlackBerry Smartphones without needing GPS. FindMe offers the opportunity to “tag” commonly visited locations, such as home, office, soccer field or favorite bars and restaurants, and post those locations on their Facebook profiles. Unlike many location-sharing programs, FindMe doesn’t broadcast geographic location information. Only the names of locations that the user has tagged will be shared on their Facebook profiles. Since FindMe uses cell tower location rather than GPS, it will work with any Smartphone. The first release works with all CDMA and GSM BlackBerry devices with trackballs—chiefly the popular Pearl and Curve models. For those who may wish to organize impromptu get-togethers with friends, FindMe allows them to add additional location information, such as a favorite place’s postal code, enabling the application to offer a map or directions to their current location. FindMe is available for all BlackBerry Smartphones with trackballs, including 81xx series (Pearl) , 83xx series (Curve) and the 88xx series at www.electricpocket.com/findme. My experiences with the application so far have been really positive. Again, like Google Maps' My Location, FindMe works within a range - so if you move from your living room to your neighbor's house (or even the neighbor a few doors down) FindMe will likely associate you with still being home. But jump in the car and drive a six blocks or more and FindMe will allow you to tag the new location. FindMe does a really good job of letting you know when you are in new taggable location - the homescreen shortcut actually changes, so with a quick glance and a couple of clicks you can easily mark all of your stomp'n grounds so your Facebook friends can keep tabs on ya 24/7. 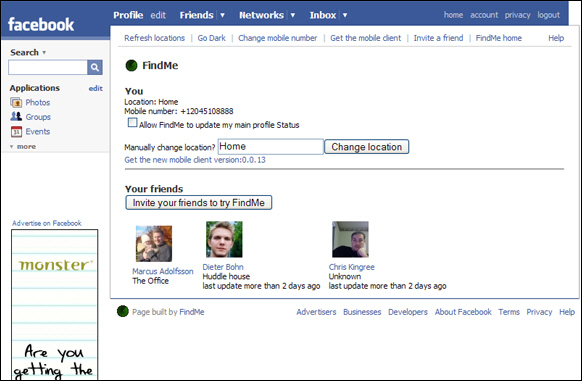 Click into the Findme App on Facebook and you can See Where Your Friends and Colleagues Who Also Have the App Installed Are At! "Dieter, Get Back to the Office!" FindMe's pre-beta is now complete, so they are ready to take on more beta testers. Give it a go, and let everyone here know what you think! And while we're on the subject of Facebook and BlackBerrys, if you haven't loaded up CrackBerry.com's new BlackBerry PIN Exchange app for Facebook yet, you'll want to do that now! There's over 4,000 users and it's growing daily - PinExchange.com.